Let's talk decks. When people start talking about brands and skateboarding most of them are going to be talking about the deck makers. This is especially true for beginners. People go out and buy completes and start paying attention to the wheels, trucks, bearings, risers, and so on only after they become more experienced and find out kind of skateboarding they like to do. 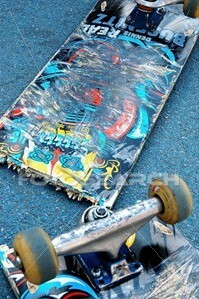 The most common attributes of a deck that are either raved or dissed are the shape, weight, pop, and durability. The graphics, concave, and shape of the deck are the most obvious features. Graphics are like the visual stimuli of a deck and a lot of skateboard makers try to create an image for their decks using a graphic theme, think Blind's reaper image and Habitat's eco graphics here. Concave is the curve of the deck design from side to side, and is really about personal preference and probably your feet. Most skateboards have a common shape, which is a rounded nose, a tail with rise that is slightly squarer than the nose, and straight lines on the sides. One of the first things that needs to be realized is that most decks are made of layers of maple wood veneer with glue and pressed in a mold. Wood chips, cracks, breaks, and retains water, which means you deck will chip, crack, break, and retain water and a lot of that will have to do with what you are doing and how you take care of your skateboard. Decks break when there is too much stress put on the wood. That means that when a skater lands his feet in the middle of the board instead of the trucks the board will be more likely to break. If you are doing big air the chances of breaking the deck when you land off the trucks is going to be directly related to your weight and also the surface you land on. Why would the surface matter? Because the wheels and trucks have to get support, if you land big air onto a lawn and the wheels sink into the ground all of the stress is on the deck instead of the trucks and wheels where you want it to be. The deck will probably break unless you're a lightweight. Chips happen because wood chips when you bang it on hard surfaces like concrete. Chips near the nose or tail aren't so bad because you can repair them or live with them mostly. Chips in the middle mean trouble because they weaken the board where it is most likely to break. A common complaint about decks is that they "square tail" which means the roundness gets worn out of the tail. Cracks happen from both chips and stress. Over time, big air will cause cracks even when you always land on the trucks. Eventually the cracks will extend and the board will break. The more big air you do and the heavier you are the faster that will happen. If you take a piece of wood and throw it in water it floats. It also absorbs water and eventually sinks as it becomes waterlogged. A wooden skateboard will do the same thing. If it gets wet it will absorb water. The wetter it gets the more water it will retain. The result is the deck becomes heavier and loses its pop.